Definition of matter- Anything that takes up space and has mass. - All matter is made of tiny particles. - There is space between each particle. - The particles are attracted to one another. - The particles in one substance are different from the particles in another substance. The kinetic energy of a substance is the energy it has due to motion. All matter is composed of particles that are moving. This means these particles have kinetic energy. These particles move faster when they are heated. of a substance as: The average kinetic energy of it's particles. the temperature. Some examples are: when we rub our hands together, we make the particles in our hands move faster, and our hands warm up. Also when we shoot microwaves at food we make the particles in the food vibrate faster, which makes the food hotter. All matter takes the form of either solid, liquid, or gas. Water is the only substance on Earth that is present in all three forms at the same time. Solids have a fixed shape and a volume that does not change. in a solid are packed closely together. There is a strong attraction between the particles which cause them to stay close together. They vibrate in place but do not move around. a solid. This means they can slide past each other and move slightly around. collide with each other and move around. 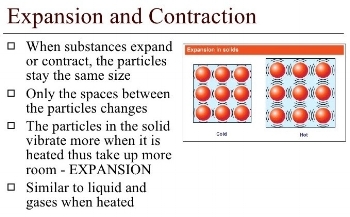 Thermal Expansion - When an object is heated, it's volume increases ( it gets bigger). Thermal Contraction - When an object is cooled down, it's volume decreases( it gets smaller). ball and ring apparatus (demonstration). Train tracks/bridges have expansion gaps so they don't bend/collapse in the summer. A balloon gets smaller when placed outside on a cold day. Telephone wires expand and sag in summer. Question: Why does matter expand when heated and contract when cooled? Answer: When matter is heated, the particles move more quickly. When they collide with each other,because they are moving faster, they have more force and bounce farther apart. When the particles move farther apart, the objects gets bigger- it expands. There are three states of matter- solids, liquids, and ?gases. When a substance changes from any of these ?states to another state, it is called a Change Of State.